With cell phone calls, e-mails, overbooked appointments on our calendars, and full personal lives, we are often multitasking. We try to squeeze more accomplishments into a limited time and may be left unsatisfied with their quality. This approach works for some of us, some of the time. Research conducted at Stanford University shows that our division of attention may cause stress and burnout. Even multitasking’s overall effectiveness is being questioned. The field of mindfulness and meditation is directed toward training us to keep attention on one thing at a time and to slow down our rapid pace. The most impactful conversations generally require more devoted attention. Make sure you are paying attention to the other person as well as yourself. 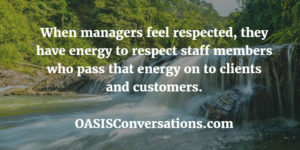 You may think this sounds obvious; however, I have coached many managers and executives who focus primarily on themselves. They don’t have much interest in the person they are speaking with. Terri, a marketing executive, kept most of her attention on how she was perceiving the world. She displayed little interest in her employees and did not inquire about how they perceived things. Since she had more experience in marketing, she did not believe her staff had much to offer. She thought they were just there to carry out her orders! Needless to say, her staff members were not motivated to support her or the organization. Once Terri learned how to shift her attention from herself and her thoughts to include others and be present and focused with them, she created a positive team environment and began getting better results. Be fully present for a conversation. If you are still mulling over the previous meeting, upset about an argument you just had, or thinking about the next task, you can’t concentrate effectively. Learn to shelve the many other things competing for your attention. Direct your attention to the person you are talking with and the current conversation. With practice, you will acquire the skill of shuttling back and forth between the other person and yourself. You’ll pay attention to how you are reacting, share your own reactions, and still show interest and be curious about the other person’s state. Leaders who have developed the skill of paying attention stand out in the crowd. People appreciate getting your full attention and, in turn, they are more apt to give you theirs. Sometimes it seems like time stops when we are present with each other. More can then be accomplished and interactions become more satisfying. Leadership presence, a core competency that successful organizations emphasize, positively differentiates staff and managers from the competition. Children can teach us about being present. When my daughter was five, she wrote in a school project, “I love my mother because…she keeps me from drowning in the pool and exercises with me.” In fact, I was fully attentive with her during these two activities. I would intentionally let go of other concerns and give her my full attention. She experienced the difference. Children are naturally present. They are often not worried about the past or future. They focus on what is happening in the moment. They exhibit and experience a contagious sense of aliveness and excitement. It’s hard not to smile when interacting with young children and becoming fully engaged. 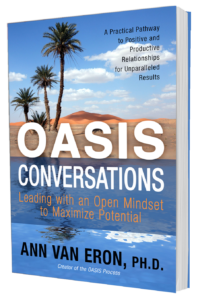 The OASIS Moves will support you in being more present in your interactions. Set the intention to be present and to listen to others as well as yourself. Stay in a curious and open state to see what you can learn. Remind yourself to feel your feet on the ground and notice that you are living in your body. Pause and breathe fully—allow your abdomen to fill with air, not just your chest. Notice your feelings as well as your thoughts. Feelings are like waves that move through your body and relax as you notice them. Ask questions of the other person and notice what you find interesting. Expect to learn something from an interaction and look for the learning. This entry was posted in Communication, Focus by Ann Van Eron. Bookmark the permalink.